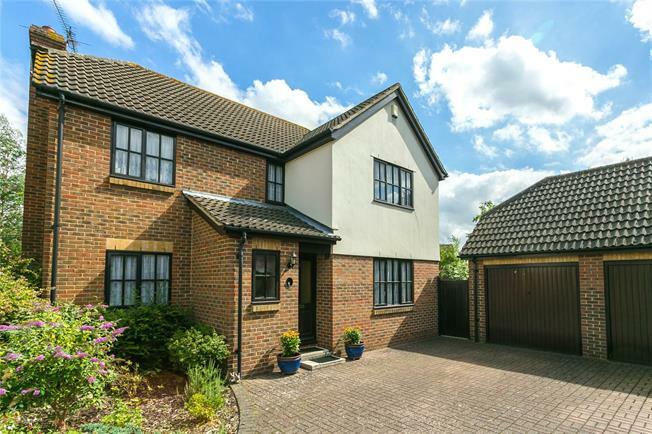 4 Bedroom Detached House For Sale in Chelmsford for Asking Price £635,000. Situated in a quiet cul de sac in the delightful village of Writtle is this detached family house offered with no onward chain. The comfortable accommodation includes, master bedroom with fitted wardrobes and en suite shower room, three further double bedrooms all with fitted or integral wardrobes and family bathroom with tiled walls, There is a ground floor cloakroom, sitting room with French doors to the garden, dining room, study, kitchen with integrated gas hob and electric oven, Amtico flooring which extends to the utility room. There is ample parking to front and an impressive detached double garage. A traditionally English setting, Writtle has an historic centre with timbered houses, impressive churches and a Village Green complete with duck-pond. The village hosts an array of facilities and amenities including a butchers, small supermarkets, post office, cafes, bars and restaurants, all surrounded by open countryside and is the setting for Writtle Agricultural college. Hylands Park is closeby. Main line rail services (London Liverpool Street) are from nearby Chelmsford with road links via A12/M25 and A414/M11 for Stansted Airport.